You can also shrink our Free Gingerbread Template to make tiny gingerbread houses. Open the .pdf file and look in your printer settings for a way to print the page at 50% or whatever size you desire. 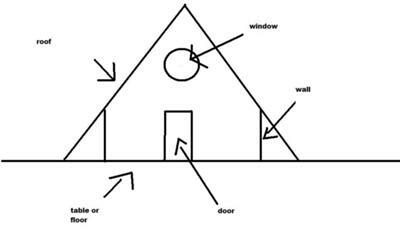 To understand how you can easily make this house's template, quickly make a mock-up. Take an 8 1/2" x 11" paper. Fold it in half to 8 1/2" x 5 1/2". Fold it in half again to 8 1/2" x 2 3/4". The first fold gives you the two sides of your roof. The second fold gives you the two sides of your house. To determine the "pitch" line (or inverted letter "V" shape) for the front and back of the house, invert your first folded paper on a table surface (so it sits like an inverted "V"). If it won't stand-up, put heavier objects on either side to stop the folded paper's sliding. Measure the paper's edges that touch the tabletop left to right and from this baseline, measure the height of the pitch from the baseline (center point of roof)and "up" to where you decide to place your side walls. Notice that you can vary the roof's pitch line by bringing the paper's edges closer to center or not. Transfer your measurements to another piece of paper to create the front and back of your house. Establish your center line on the front of the house from pitch to baseline (to properly place your window and door). Find objects in your house that can create the cuts for your circular window and door (bottle cap/tiny matchbox). Look at photos of other gingerbread houses to determine how you want to decorate it. Remember, Royal Icing is the "glue" used to build your house (recipe on this website).